It’s hard not to feel bad for Seth Lugo every time he goes out to pitch. The 27-year old journeyman missed two months with a partial UCL tear in his throwing elbow. He didn’t get a big signing bonus, and this is just his first year in the big leagues. If Lugo shuts down his arm and goes for surgery, he may never get back to the big leagues. On the other hand, if he keeps pitching with a partially torn UCL, it could snap at any moment. Lugo came out Sunday like a pitcher who didn’t fully trust his arm. He kept throwing pitches over the middle of the plate and hoped that he could fool hitters just by moving up and down the zone. Nelson Cruz struck first, with a three-run upper deck homer. When Leonys Martin hit his first home run of the season off the facing of the upper deck, it was pretty clear that this wouldn’t be Lugo’s day. When Yoenis Cespedes lost a ball in the sun and it fell for a “triple,” it felt like we could just fast forward to the end of a seemingly inevitable 9-1 loss. Every pitcher the Mets threw out raised more questions about what this team’s plan is. Lugo only allowed one infield hit over the next three innings to stabilize his day. When the Mets activated A.J. Ramos, it seemed like Fernando Salas would get released. Instead the Mets designated Josh Edgin for assignment and Salas came in for the sixth. He got an out, then a routine ground ball that Neil Walker couldn’t handle at second. Salas isn’t good enough to survive giving a team extra outs – he walked Mike Zunino and later Ben Gamel singled in a run. With Edgin out of the pen, Terry Collins turned to Josh Smoker as his lower leverage lefty for the seventh. It was his turn to give up a run. Finally it was Ramos’ turn. Collins wanted to get him work, even down 7-0. Ramos pitched like the stereotypical closer who doesn’t focus well when used in non-save situations. He gave up a walk, single, and then a double play ball that Walker threw away on the turn. After allowing a run, Ramos gave up two wild pitches in the dirt and another single to make it 9-0. The Mets mounted a small two-out rally in the top of the ninth to avoid a shutout, but Michael Conforto looked at strike three to end the game. Jose Reyes got drilled in the forearm by a 98 mph fastball in the top of the fifth inning. He crouched over in pain and had to leave the game immediately. 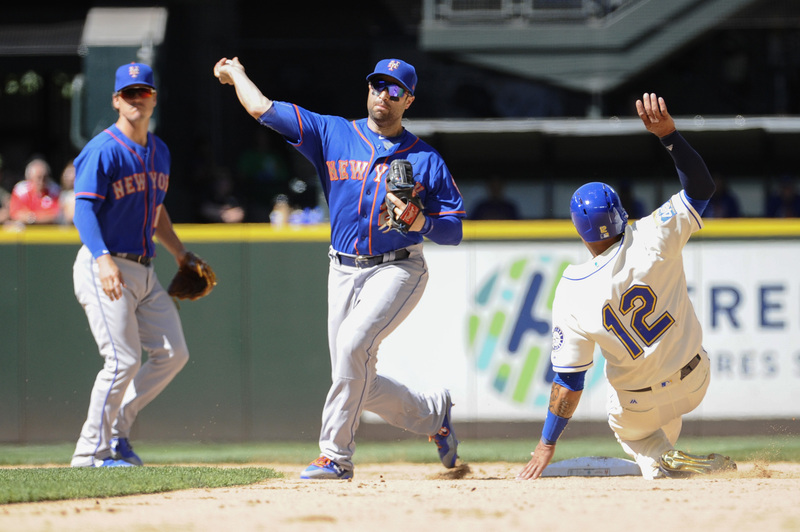 Matt Reynolds moved over from third base to shortstop, while Asdrubal Cabrera entered the game at third. Marc Carig reported after the game that Reyes’ X-rays are negative. If Reyes is out for a while, remember that Reynolds is primarily a shortstop. It would be a mistake to assume that the Mets have to call up Amed Rosario because they don’t have any shortstops on the current big league roster. After all, they kept Reyes’ .286 on base percentage, weak glove, and awful off-field character there every day. The Mets don’t play again until after the trading deadline, but Addison Reed has been on the rumor mill for over a week. Many assumed the only rational reason for the Mets to designate Edgin for assignment was if they had lined up a trade. Once a player is designated for assignment, the team still has a week to trade that player before releasing him. However, Anthony DiComo reported just before the game that the Mets don’t have a trade for Edgin in the works.